La Di Dah Dress https://www.review-australia.com/au/la-di-dah-dress/RE19DR132.RENVY001.html Let the La Di Dah Dress make a sophistiacted statement at your next event. This stunning monochromatic cocktail dress is a classic you'll adore for seasons to come. With an A-line skirt, the dress has a fitted bodice and waist. A layer of textured emrboidered mesh provides structure and depth, offset with soft georgette ruffles. The flattering dress has a soft round neckline and back zip closure. La Di Dah Dress is rated 4.9 out of 5 by 52. Rated 4 out of 5 by TimG from She looks so beautiful in it! I had been looking at the Lah Di Dah dress for a while. I loved the pattern. I loved the colour and I really loved the lace at the bottom hem. It looked both classy and relaxed at the same time. One Friday night after a few wines I bit the bullet and ordered it. I gave it to my wife as a surprise and she tried it on straight away. It was as breathtaking as I’d hoped. It is a great cocktail dress. You could even wear it to work if turning heads is your aim. Rated 5 out of 5 by Amy.D from Perfect and versatile I walked into Review in need of a super-dress. It needed to be suitable for a work Christmas party, a church event, a wedding and fancier family visits. This dress is perfect: it works with heels, flats or boots. I can accessorise it with different tones and colours and make it look completely new every time. It’s modest but the frills make it fun and flirty. Perfection! Rated 4 out of 5 by ksmi from Lovely cocktail dress A very flattering dress for a cocktail event! I nearly passed this one over as it didn't look like all that much on the hanger. Sooo pleased that I didn't as it so lovely to wear! Just a bit of fun with the frills, beautiful lace and lovely structure to it with enough give to make it forgiving on the mum-tum and hip area. Rated 5 out of 5 by Maria-Luisa from absolutely gorgeous When I received the La Di Da Dress I tried it on and was happy with the fit! (I am usually a size 10/12) I don't normally wear A-line style dresses as I don't like wide skirts, however, I found this style flattering. I am hoping to wear it very soon on the weekend of my wedding anniversary. Rated 5 out of 5 by Karen Rose from Beautiful dress This dress is a gorgeous navy colour and very flattering - true to size too. It has a lovely neckline and a beautiful flowing style, which really suits me - I'm in my 50s and it looks great on. The dress is just like in the photo - what you see is what you get! Rated 5 out of 5 by Karen66 from Elegant and beautiful lace I bought this to attend for my friend's wedding. 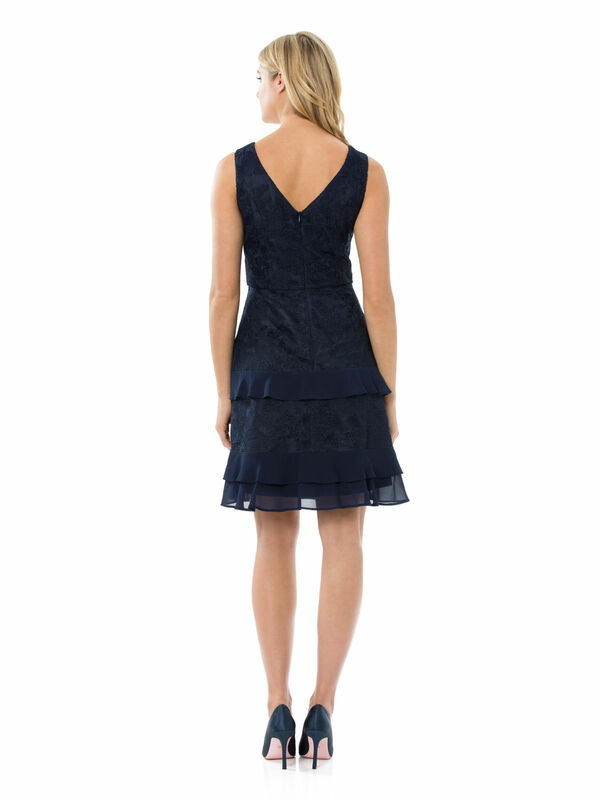 Received lots of compliments as the wedding colour theme is dark blue and this dress is simple with lace patterns. Adding a Helena brooch to the dress makes it even more stunning.